Cork screw, for when you pound the cork in too hard. The cannon is very warm compared to the LN2. 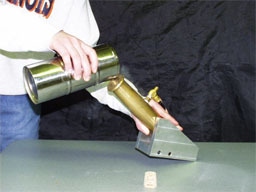 When the LN2 is poured into the cannon, the cannon starts to warm it up. When you heat a liquid it turns into a gas. Gases take up much more space than liquids. As it expands, the Nitrogen tries to take up more space, but the cork is stopping it. After a second or so, the Nitrogen is pushing hard enough to pop the cork out. Like any projectile weapon, don't fire the cannon directly at anyone. If the cork gets stuck, open the valve before you start messing with it and trying to free it. This demo should be done quickly. There are a lot of states of matter demos, and they all show pretty much the same thing, so there's no need to drag them all out. Restate that a gas takes up much more space than a liquid, and we can use this to do work. Show them the cannon and tell them how it works. There usually isn't much time to talk once you've started pouring the LN2. in, so it's a good idea to get done explaining before you DO the demo. Make sure the valve is open. The valve we currently use is open when it's pointing directly outward. Pour in (a couple tablespoons of) LN2. Quickly pound in the cork. It doesn't have to be jammed all the way into the barrel. Just try it a few times and you'll get the hang of it. As soon as the cork is set, close the valve. After launching the cork, you can ask them if they want to see that again. Open valve, pour in a little more LN2, put in another cork, close valve.